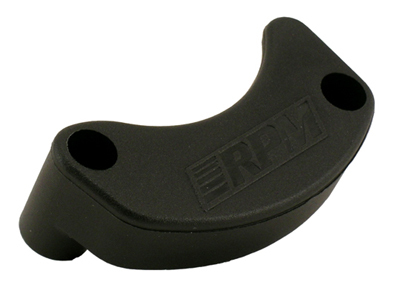 RPM Motor Protector Black Discounts Apply ! RPM80912 - RPM Motor Protector Black. Fits the Traxxas Bandit, e-Rustler, Monster Jam series & e-Stampede 2wd. Many Traxxas electric vehicles have a motor that is dangerously exposed to impacts and damage from rear impacts or collisions. Our new rear Motor Protector eliminates that problem! How did we solve it? We started with an RPM rear bumper mount / wheelie bar mount (RPM80902 or RPM80905) and extended the reach with this simple add-on piece, which completely blocks the motor from most rear impacts. A stock Traxxas rear bumper mount / wheelie bar mount - Traxxas #3677 - can be used with this motor protector as well.